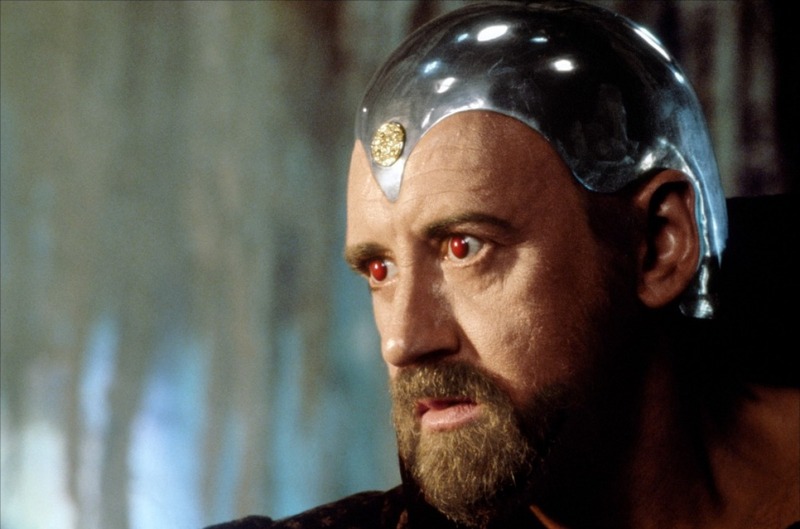 There have been many screen versions of the King Arthur legend: none as grand as Excalibur. An epic re-telling of the story, director, producer and co-writer John Boorman creates a lush yet brutal fantasy world, and sets within it an ambitious tale that is as much about love and betrayal as it is about the birth of the modern age. The story begins with the ambitious and aggressive knight Uther (Gabriel Byrne) battling for control of the land against rival warlords. Successful in battle, Uther enlists the help of Merlin the wizard (Nicol Williamson) to obtain control of the magical sword Excalibur. Uther agrees to a peace deal with the Duke of Cornwall (Colin Redgrave), but when Uther lays his eyes on the Duke's wife Igrayne (Katrine Boorman), he is willing to reignite the war for the pleasure of ravishing her. Uther asks for Merlin's help to find a way to spend a night with Igrayne; Merlin has but one condition: any offspring from the night of passion belongs to Merlin. The Duke is killed; Merlin arranges for Uther to appear in the guise of the Duke and spend the night with Igrayne; their passion is witnessed by Morgana, the young daughter of the Duke and Igrayne. Nine months later, Arthur is born and Merlin shows up on cue and whisks the young child away. Uther is ambushed and killed, and Excalibur is wedged into a stone, with no knight able to loosen it. Years later, Arthur (Nigel Terry), now a young and unassuming man, effortlessly removes Excalibur from the stone. He is immediately proclaimed King by some knights, but others are not too sure: he is too young and inexperienced, and battles break out. But Arthur's skills and generous attitude win over his doubters and he is acclaimed as King and leader of the land; indeed, Arthur's miracle is that he is "one with the land", and prosperity reigns over his Kingdom. He marries Guenevere (Cherie Lunghi), builds his elegant castle Camelot and forms the Knights of the Round Table to maintain peace and order, always with Merlin's help. A mysterious, superlatively skilled warrior named Lancelot (Nicholas Clay) makes his way to Arthur's Kingdom, and he joins the knights, although his attitude is more mercenary. The young and resourceful Perceval (Paul Geoffrey) starts out as Lancelot's assistant, but ends up a knight in his own right, while Lancelot and Guenevere are helplessly attracted to each other. Darkness begins to descend on the land. Another threat emerges in the form of the all-grown Morgana (Helen Mirren), a sorceress and Arthur's half-sister, harbouring thoughts of avenging her parents whose lives were destroyed by Arthur's father and Merlin. Morgana sharpens her magical skills with Merlin's help, and then turns against him. She also arranges revenge against Arthur, and conceives the unholy son Mordred. As pestilence takes over the kingdom, Arthur dispatches his knights on a desperate quest to find the Holy Grail, believing that this ancient artifact will save his Kingdom. But peace will not be easy to find, as Arthur has to carve out an alliance to save the land. The central theme of Excalibur is the passing of the fantastic age of sorcery, with humanity transitioning to a less mystical, more accountable time of people being responsible for their actions. King Arthur is Merlin's final creation and contribution, a final hurrah for magicians to meddle in day-to-day affairs. With the passing of Arthur's kingdom and Merlin's dis-empowerment, it is now up to mere mortals like Perceval to find ways to serve the cause of society. With the entire legend of Arthur being shrouded in mystery and folklore, Excalibur draws a loving line between pseudo-history built on the supernatural according to imagination and legend, and actual subsequent events, where magicians are not welcome. 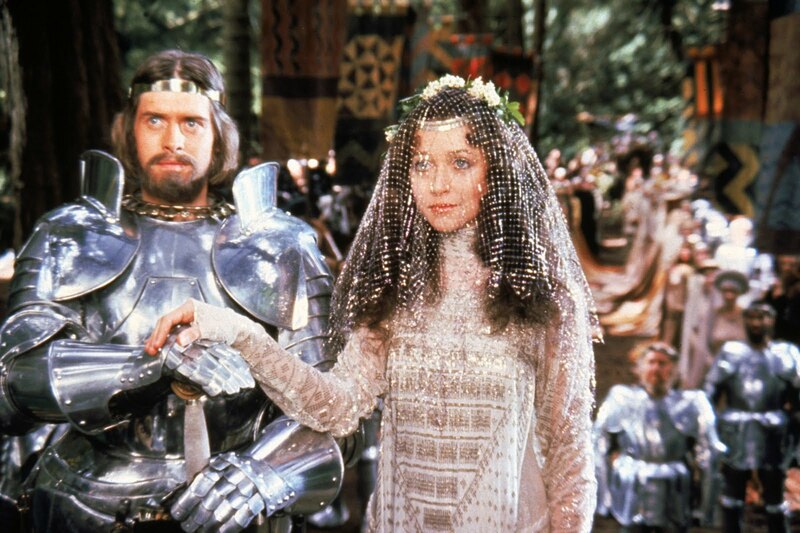 Filmed in Ireland with a mostly Irish cast and crew, Excalibur's set designs are monumental and create a setting that is enticingly attractive and horrifically dangerous. Boorman moves his cameras effortlessly from ancient castles to mist-shrouded plains and dense forests: gorgeous waterfalls, moats, rivers, lakes and scenic bridges provide the backdrop for scenes ranging from tender romance to barbarous, limb-hacking close-quarters combat. The cast of Irish and British actors fit perfectly into Excalibur's world, and the lack of high-wattage star power is a definite plus. The movie is about legendary events and a suite of memorable characters rather than an overpowering central presence. 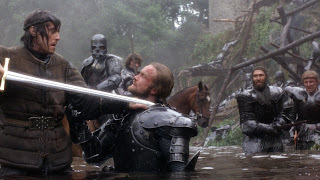 Boorman purposefully used the name of the sword as the title of his movie, signifying the symbolism of the legend as more important than any of its participants. The music, by Trevor Jones and using chillingly epic extracts from Orff and Wagner, adds to the monumental atmosphere, as do the heavy duty, heavily metallic knight costumes designed by Bob Ringwood. Excalibur is 140 minutes of grand storytelling, entertaining mythology on a luxurious scale, and an unforgettable journey into the glorious mists of legend.